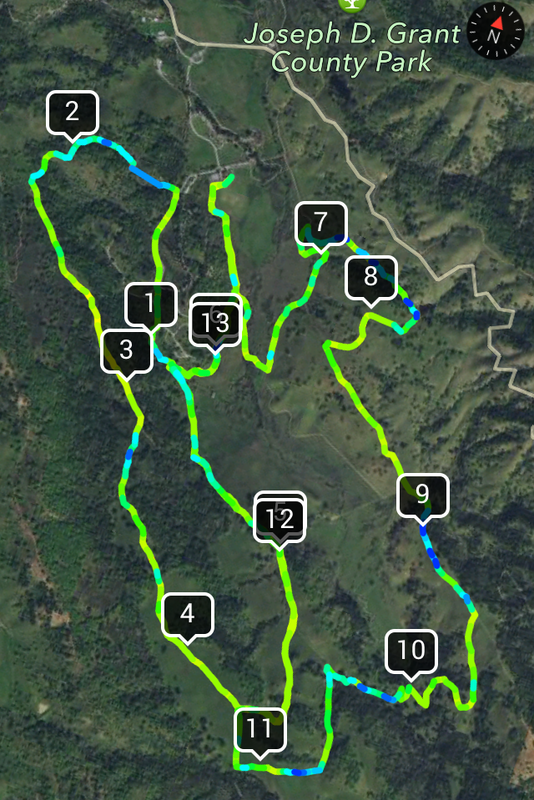 ← Trail Run: What was I thinking! Trail Hog San Jose CA. After driving 10 hours from San Diego to San Jose CA I had a little less then 2 hours to rest before leaving for Joseph D. Grant park located on Mount Hamilton in Santa Clara county. Once you got to Mount Hamilton the park was located 8 miles in on a winding road; there were no signs so the would time I was driving I was not sure I was going the right way but eventually I came to the entrance of the park/campground. IT WAS FRIGGIN’ COLD! coming from San Diego I was worried that it was going to be hot by the time the race started at 8:00AM but boy was I wrong. People were grouped like teenagers in the yard just before class started or in line at the restrooms; all hugging and rubbing themselves in attempts to stay warm. I was no different standing in the sun light hoping for it to provide just a little warmth. I was tired but would soon forget the fatigue I felt, excitement and anticipation of the race replacing it. It was 20 minutes from the Half Marathon start time and I spent my time people watching. You know at every race there is that guy… The guy who dresses up like a ‘pro’ and articulates their bodies in ways bodies were not meant to; sort of a hybrid of Karate, Yoga and Jedi stretching and motions. Man he looked fast… and got lots of attention. This being my first Trail Run and first Half Marathon I was not entirely sure what to expect; I thought that I was well prepared for the task at hand; I would find out soon, very soon how wrong I was. I will tell you that it was nothing like I expected, rather it was the hardest race I have ever taken part in. I don’t look too happy LOL no idea why. When the announced the start of the race I tried to stay in the back because I planned to start the race at a 11 minute mile pace and didn’t want to slow other runners down, but it seemed like people kept going behind where I was rather then in front of me. I’m guessing I ended up in the chute about mid-point. As we all started ‘trotting’ off I found that I was soon at a 9 min mile pace, way faster then I wanted to be and way faster then my normal pace; but I was stuck in the pack. The dust was unbelievable! the movements of bodies and feet in front of me created a cloud of dust and stuck to you, any sweat turned it into a fine paste. I would find out latter that the dust was so fine it penetrated both my shoes and socks, when I took off my socks it looked as though I had run bare foot. I moved as far as I could to the right so I could slow down some and it was at about that time we hit the first hill. It was then I realized that I had under estimated this race; the hill got so steep I found myself hiking rather then running and I hadn’t even hit the 2 mile mark! ; I ran as often as I could to get up this hill. The first two miles of this race was already murderous and I was so happy to see the first aid station and the down hill just beyond it. The problem with going down, I would learn, is that eventually you have to go up again. The up and down repeated itself throughout trail run, not unexpected but defiantly challenging. Mile 3 a older gentleman passed me; I would later pass him and he in turn would pass me. Just before mile 7 the injury I got from the massage I wrote about in my last posting reared its ugly head. The pain in my left leg just above the heel and ankle join made itself well known; not so bad I couldn’t run but bad enough where my body started to compensate adding more work to my right leg. This in turn started to make my right ankle ache. I wasn’t going to let it stop me so I tried as best I could put it out of my mind. I did seem to get a little better as I raced on, but that could have just been my mind redirecting the pain. Between mile 7 and 8 I caught up to the older gentleman again, this time on a path only wide enough for one person. He started to make room for me to go past him but the lactic acid in my legs going up this hill had to be the same as his and I said to him; “Don’t worry about me, you’re my hero!” we walk and ran like this for most of the hill and when I felt recovered enough I took the lead. I wouldn’t see him again until after the race. Mile nine I started passing people who I had seen with the lead pack at the start of the race. Into mile 10 I was alone; I couldn’t see anyone behind me or in front of me. I seemed to like this better I don’t know why, I seem to be distracted when running around others. 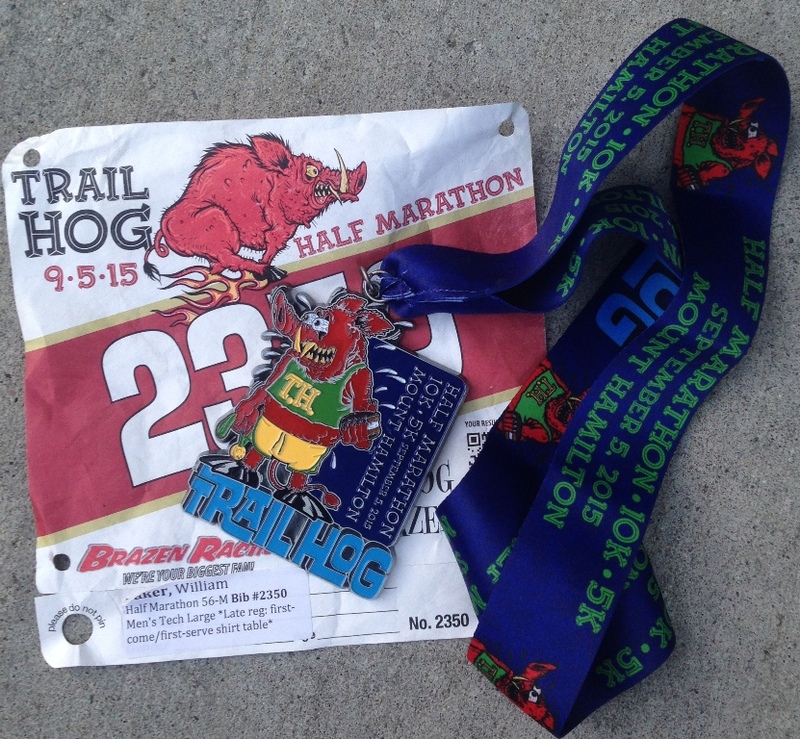 My performance seemed to improve and I was able to pick my pace up just a bit. Mile 12 at trail guide said “Good Job! you at mile 5!” jokingly that made me laugh. When I hit 13 miles I was jazzed my brain kept thinking .10 miles left but I knew I had .50 miles left as they told us at the starting line the course was 13.5 miles not 13.1. This played with my mind and I just couldn’t seem to get the energy up to break into a sprint the last .20 mile. Coming across the finish line I had hope my family made it up to cheer me on because I felt accomplished but no such luck. 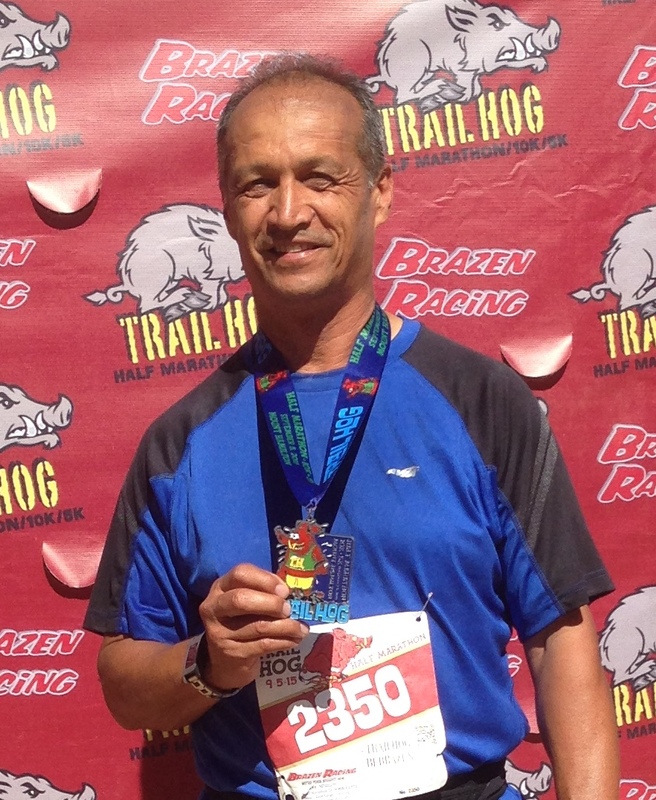 I crossed the finish line in 13.5 miles , 2:36.20 minutes an average pace of 11:34/mile; Overall Finish 94th of 160 runners, Age group 7th of 11 runners. Although this was the hardest run I have done I would have to say it was the most rewarding; I earned those positions and am okay with where I finished. I’ll do much better next time now that I’ve done one. 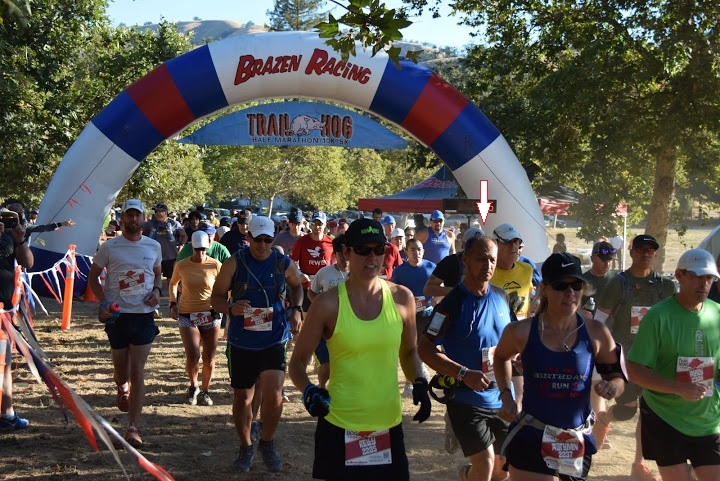 This entry was posted in Running, trail running and tagged 13.1 miles, Half Marathon, Joseph D. Grant, Mount Hamilton, running, Trail Hog, trail run, trail running. Bookmark the permalink. 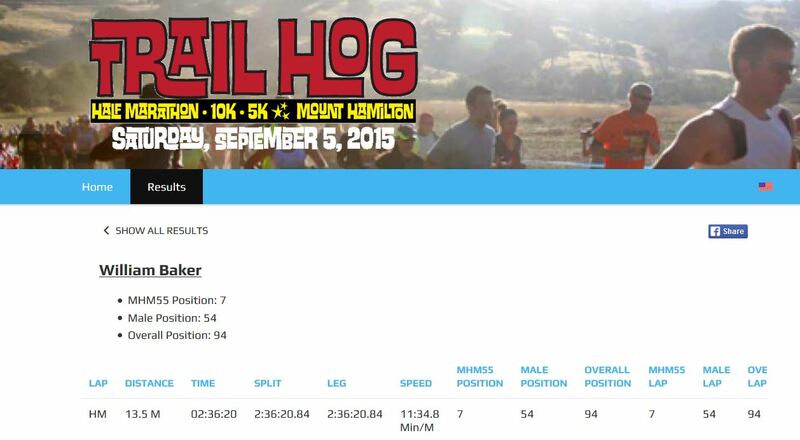 23 Responses to Trail Hog San Jose CA. Well done. You coped with the terrain presented and got to the end. Nice work. Thanks Paul, I was hating the run during but after reflection I loved the run. I’m ready to do it again. Thanks I was fun; LOL what’s wrong with me. The more challenging a run, the more rewarding the finish is. It sounds horrible and fun all at the same time. I’m glad that my half is mainly downhill 🙂 Maybe one day I’ll get spontaneously brave. Hey hey, way to go! More than a half-marathon distance too (that ALWAYS happens on trail races it seems… distances are vague and approximates!) Rest up, you’ve earned it, and I bet you’ll be hitting the trails again soon enough! Thanks, Can’t wait to try another trail run. Only wish I had someone to run with so I could run trails normally. That medal is awesome! This pretty much sums up every trail run I’ve ever done. I don’t think you can ever be really prepared. Plus, I have destroyed about half of my socks from them getting saturated with mud. 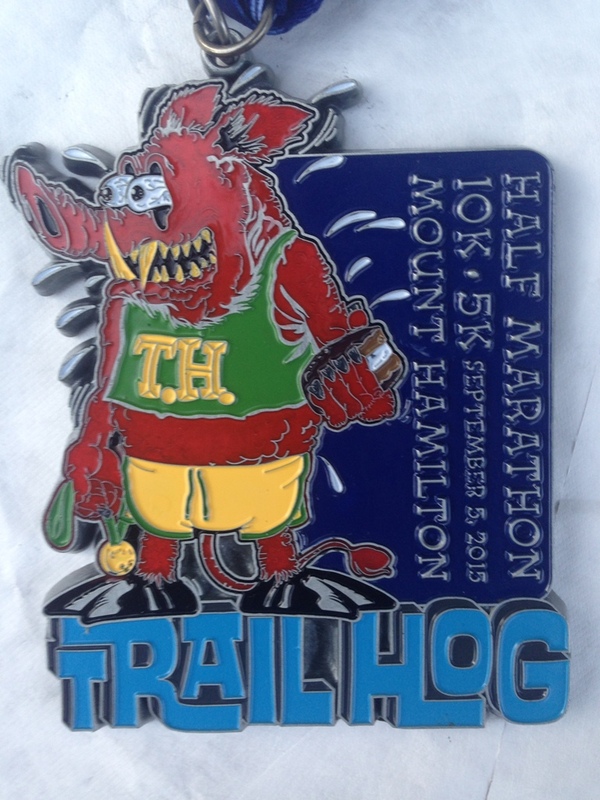 That’s a great time for a trail half! Are you hooked now? LOL Yes I’m hooked; how did you know. I wasn’t when I finished even told my family “I’m not ever doing that again” and here I am thinking about the next Trail Run. I thought allot about you on this run. Seems at one point I contemplated “sitting on a rock ” then I thought naaaa don’t want to be that guy in a Jane Likes to Run post. So I guess you were one of my motivators! I have to give you props! the distances you can trail run amaze me. 2:36 is an AWESOME trail half time! Great job and welcome to the real hills! Don’t worry, everyone but the elite athletes hike them. Often times I find myself hiking past the people who are trying to run up. I love to run up hills but I was totally unprepared for this run. Now that I know what to expect I ‘think’ I can improve. Thank you! Fantastic effort, especially for a first time on the trails. Are you hooked on trail running yet? Also, did you make your qualifying time? Yeah, definitely hooked on Trail running! Problem is practicing trail running is difficult for me because I don’t have a run buddy. I’d hate to be out on a trail and get hurt or have a medical issue. BUT, that’s not going to stop me from running trail events. I’ve got some eyed for next year. Thanks for all the advice over this year its really made a difference in my running abilities.